A radical Muslim clerk and terror suspect Mr. Aboud Rogo Mohammed was shot dead today morning while driving in Bamburi area Mombasa County. The cleric was driving a sick family member to hospital. The van he was driving had a minimum of three other passengers at the time including his wife and father in law. As per accounts by his wife Haniya Said Saval, they had been trailed by another car for a while, they were later overtaken by the car and in a moment more than 15 bullets were sprayed on Sheik Rogo. He died on the spot. The motive of the gunmen could not be immediately established, police are investigating the attack which his supporters suspect to be extra judicial killing. The clericâ€™s shooting is generating tension in Mombasa, with Muslim activists contemplating to call for demonstrations in the streets of the coastal town this afternoon. Security is already beefed up in Mombasa; Rogoâ€™s death is the latest in a string of mysterious killings of Muslim scholars and clerics in the recent past. Sheikh Rogo was arrested in 2002 after claims that he participated in Kikambala paradise bombings in which fifteen people, including six members of traditional Giriama dance troupe, and three Israeli nationals died. He was released after 2 years in prison due to lack of evidence. Sheikh Rogo was previously arrested more than three times on terror related activities, the latest being early this year, charged with being in possession of firearms, ammunition and explosives with intent to commit a terror activity. 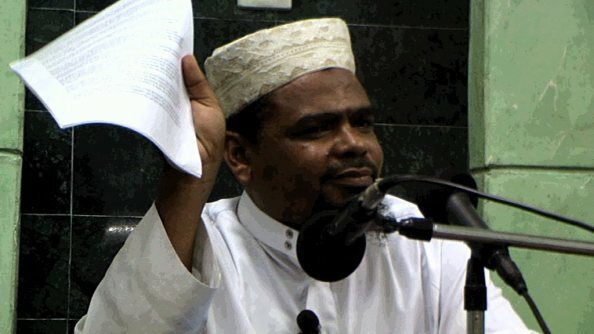 Aboud-Rogo Mohammed also known as Albadiri was a cleric in Mombasa for almost fifteen years. Good bless him..we love peace in mombasa..
God bless him and send him to the (Janatul-naim) oohh! my fallow muslim have it in your mind that we muslim we are not in peace because of our Faith in Al-Migth ALLAH. Peace will come at a price…let us not forget those who fought for it. They used AK bullets see the van the bullet entered on the rigt side came out on the left. It is time Kenyans stand up for there rights. Dont burn churches, instead government offices etc.. That way you will get the message across. Njama za Makafiri kuupinga Uislam kwa means zote, hata mauaji ya wasema kweli. I think a balance bteewen the two which is what I had is what I would do. I don’t regret our choice, neither does my husband.We invited the family and close friends we wanted, we didn’t limit the guestlist, and we had 125 people show up.We kept everything to nice but not ridiculously extravagant choices. We didn’t serve filet mignon lobster, we had a buffet of roast beef, stuffed chicken breast crab cakes which our guests really enjoyed. We shopped around for good food at a good price.We didn’t rent a crazy location (we looked at a mansion which cost $ 3,000 just to rent) – we went with a reception hall which was $ 300 plus the food had to be purchased from them.We set a budget that my now-hubby I could afford, and actually were able to come in under budget. Compared to some people here on YA, we had a large budget, but for our area (Northeast United States) where weddings easily cost $ 30,000 and up, we had a budget wedding that came in at $ 18,000 I did alot myself and also did alot of shopping around. We didn’t go into debt to have our wedding. We already own our home. We both own our cars and we have toys.We don’t regret it.